Percona Toolkit is one of our most mature open source applications. Derived from Maatkit and Aspersa, Percona Toolkit has evolved significantly over the years. The software now contains 32 tools, over 4,000 tests, and has been downloaded over 250,000 times. Anyone who manages a database – from DBAs to system administrators to even software developers – benefits from Percona Toolkit’s ability to perform a variety of MySQL server and system tasks that are too difficult or complex to perform manually. 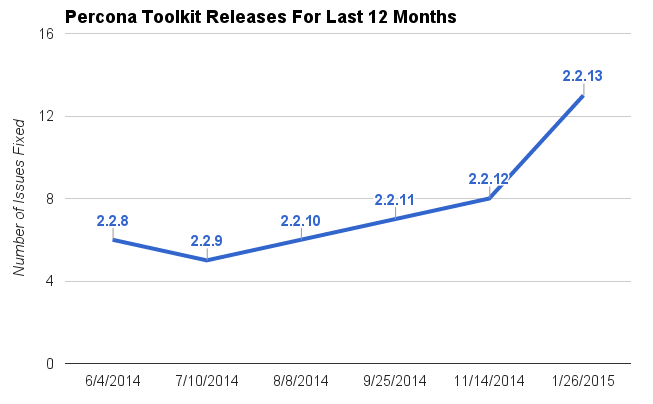 We continue to make Percona Toolkit better each month. Over the last 9 months alone Percona has had 6 releases and resolved nearly 50 issues. I’ve just committed some changes to diskstats, an I/O analysis tool in Aspersa that’s actually been in the Subversion repository for a long time, but in a barely usable fashion and with no documentation. Now it’s usable and documented. I’ve written a tool to profile a process’s IO usage. It works by gathering lsof and strace from a process, and then figuring out how the file descriptors, function calls, and filenames are all related to each other. The manual page has examples. I’m curious to see how it works for you. Note that it might be a good idea to run this on your development or staging system before you go running it against your production MySQL server — there are rumors of strace misbehaving on some kernels. For those of you who miss what Maatkit’s mk-audit tool (now retired) gave you, there’s a pair of tools in Aspersa that more than replaces it. I wrote previously about the summary tool. I don’t think I have mentioned the mysql-summary tool. It has been under development for a while, and at this point it has quite a lot of functionality. You can see a sample of the output on its wiki page.